After 17 hours of deliberation, on the morning of July 13, 1906, the jury announced a “Not Guilty” verdict. Walter Barieau walked from the courtroom a free man, and the dark cloud of shame gathering over the Logan family billowed in proportion, destined to follow them for decades to come. Following his acquittal, Walter Barieau, his wife and daughter boarded a steamship to Panama and left the country. In later years, he is reported to have once managed a casino in Mexico for Jack Dempsey, worked as a bodyguard for the infamous Nevada political boss George Wingfield, and won and lost several fortunes in the gaming industry. 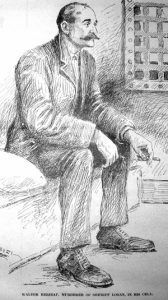 Barieau, whose own father had been acquitted of killing his pregnant wife, died penniless and alone in San Diego at the age of 84 on July 4, 1953. To this day, rumors persist as to whether or not the hot-headed gambler was actually hired to kill Logan—a possibility for certain, but most likely to remain an eternal mystery. NOTE: On May 28, 2011, 105 years after Sheriff Tom Logan was killed in the line of duty, then Nye County Sheriff Anthony DeMeo posthumously awarded him a Purple Heart and Medal of Valor—noting it mattered not if Logan had been shot on the steps of a brothel or a church, he had acted in the interest of public safety and in so doing had made the ultimate sacrifice as an officer of the law. 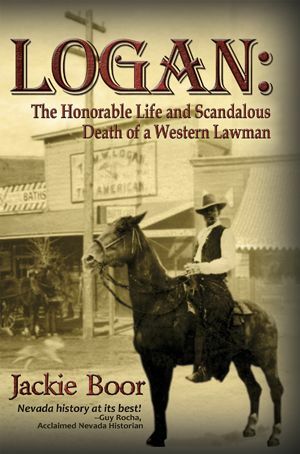 “Logan: The Honorable Life and Scandalous Death of a Western Lawman”, by Jackie Boor, 2014. LOGAN is Nevada history at its best! – Guy Rocha, acclaimed Nevada Historian. Gritty, truthful and edged with poignant sadness. – Bob Boze Bell, True West Magazine. Happy to keep this book on my shelf. – Mark Hall-Patton, Pawn Stars, History Channel. Jackie Boor began her freelance writing career in 1968 as a teen correspondent for two Northern California newspapers. Her first major work, the award-winning memoir of LTC Gene Boyer, was published in 2010, and is titled “Inside the President’s Helicopter: Reflections of a White House Senior Pilot“. A resident of Sacramento, CA, Jackie began researching Nevada Sheriff Tom Logan, her great-grandfather, in 1985 and spent nearly 30 years gathering content for “LOGAN: The Honorable Life and Scandalous Death of a Western Lawman“, published in 2014. In 2015, Midwest Independent Publishing Association awarded LOGAN first place in their history book category. LOGAN also received honors in two categories of the annual Eric Hoffer Book Awards, one of the largest international book awards for small, academic, and independent presses. An accomplished public speaker and workshop presenter, Jackie also enjoys gardening, golf and spending time with her family—both those in the present and from the past.